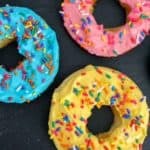 Your kids will enjoy these healthy April Fools Donuts. Hint: It is not a doughnut and that is not icing! First, cut apples into slices. Spread the colored cream cheese or Nutella on apple slices. Lastly, add sprinkles on top!